Information on the Trojan Horse. 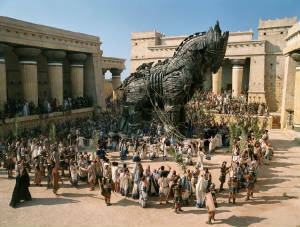 The Trojan horse was a very large wooden horse, built with its inside hollowed out. It was hollowed out so that it could hide soldiers inside of it. The Ithacan army sent it to the outside gates of Troy, and left it as a gift. The Trojans, not knowing that there were soldiers hiding inside of the horse, brought the horse in and celebrated what they thought was the end of the war. They all got very drunk and were oblivious to the fact that soldiers were coming out of the horse. These soldiers then started slaughtering the Trojans, winning the Trojan War.